Amazingly, it's the last day of the year again. I swear that the older I get, the faster time passes. It's been quite a year, both in my fiber-y life and my personal life. I have a bit of a tradition of doing a reflective blog post at the end of the year, so even though I am sitting next to the pool in almost 80 degree heat many miles away from my stash, I don't think it's time to break with tradition. I completed several large projects this year, namely three sweaters for me. The first of these was a major accomplishment because I spun the yarn for the sweater myself (a feat I hope to be repeating in the new year when I spin up the fleece I bought at MDSW). It was also a year of knitting for others, though, as I finished a gorgeous sweater for Rainbow, a number of baby gifts (with more to be knit in the coming months), and several items for charitable causes. In many ways this year, knitting took a back seat to spinning. With the acquisition of my Hansen miniSpinner earlier this year, my spinning time increased and my productivity dramatically increased. I burned through a good portion of my stash (though I'll readily admit I added to it as well) and won my LYS's first summer spinning contest. My longest skein of the summer -- 1,000+ yards of laceweight! The really big leap this year, though, was taking the next step toward designing knitwear. I released three patterns this year (they're over there in the sidebar; click away!) and have several more in the pipeline. I don't think I'll ever get to the point where designing is my full-time job (nor do I necessarily want it to be), but I've found it to be a great way to express my creativity and artistic urges, much as I used to do with pencil and paintbrush in the art studio back in high school. I have yet to have anything accepted by a major publication (fingers still crossed! ), but I am enjoying the freedom of self-publishing and hope to continue with it in the new year. Several new projects are nearly ready and should be up in the first quarter of next year. Dear readers, thanks for sticking with me for another year and sharing with me the highs (and some lows) of my love affair with all things fiber related. I wish you all a happy, healthy, and fiber-filled new year! It's my vacation this week, and the Mister, Rainbow, and I are on a short vacation to Florida (we're staying with my parents at their vacation home), so I though I should do a little fun knitting while we're here. I'm still working on the Snowy Owl sweater, of course, though that's been relegated to evening knitting, when I'm sure Rainbow is down for the count and I know I'll have at least an hour or two to focus on the charts. Something easy, small, and able to be put down and picked up at a whim (toddlers are demanding, you know) was needed, so naturally I packed my favorite 12" 2.5 mm Addi Turbo circs and a skein of sock yarn -- specifically, a skein of Socks That Rock that had been in my stash for two, maybe three, years. I wound it into a ball Tuesday night after we arrived and cast on yesterday morning. The pattern, if you don't recognize it, is the ubiquitous Monkey (though without purls). I have quite a few pairs of these in my sock drawer, many of them in STR, but I've noticed that some of them are starting to show their age. I certainly don't have a pair in purple yet, and this skein (the colorway is the Incredible Shrinking Violet) has been patiently waiting for me to knit it up since it arrived. I love this pattern because I have knit it so many times that I practically have it memorized (though I'll admit it's been a while since I last knit it, so I did have to go look at the pattern to refresh my memory a bit). 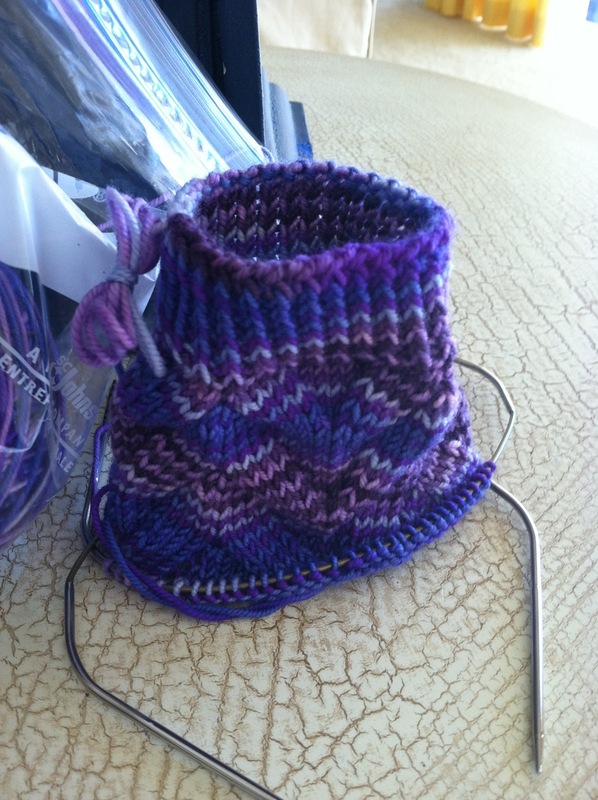 I've been working on it off and on the past two days and am already through the gusset on the first sock. At this rate, it's highly likely that I'll have a brand-new pair of socks ready to start the new year. Sorry for the unintentional radio silence. Last week was when things really came to a head -- I'd been sick, work got unexpectedly crazy, and we were preparing to go away for Christmas -- so I had little time to knit or blog. Fortunately, things seem to be getting back to normal now, and I am officially on vacation through January 2, so I am planning on catching up on things in the next week. I've been working mainly on finishing up my Cranford shawl, which still has several hours of work ahead, but it's quickly getting much smaller. I'll spare you another picture for now. Instead, I'll show you the newest project on the needles, which was cast on in the car on the way to Christmas. This is the beginnings of a Snowy Owl Cardigan in madelinetosh tosh dk (the main color is Logwood, which in real life -- and good lighting -- its actually a light purple). I finished the two sleeves, which you can see up in the top right-hand corner, very quickly and got as far as the beginning of the intarsia portion on the body in the car yesterday before putting it away. I'm about to get to the point where I'll have five different sources of yarn attached at once, so I did not think it was ideal car knitting. Fortunately the intarsia section is fairly small (only about 25 rows or so), so I should be able to get through it fairly quickly, but it needs to be done when I have time to untangle and space to lay out all the yarn. This sweater is for a baby due in mid-January, and I don't think I'll have any problem at all meeting that deadline. This is why I just love knitting baby sweaters -- if only sweaters in my size would go as quickly! Several years ago, back when the Mister and I lived in our old house, I started playing around with some sock yarn and swatched a stitch pattern. I jotted down a few notes in a notebook, but both it and the swatch got packed away when we moved and I promptly forgot about them. Then, a couple months ago, I happened to pull out the notebook to make some notes about another design idea and came across my sock notes. I made a few changes, knit up a sample, wrote up the full pattern, and came up with what you see here. These socks have a fairly simple lace pattern that is easy to memorize. The name comes from the lace pattern, as a section of it looked like a crew team rowing down the water to me. They're knit from the top down with an Eye of Partridge heel and wedge toe, but the gusset is a bit unusual. The decrease are worked on the bottom of the heel, rather than on the sides, which results in a bit of shaping that hugs the heel. I quite like the look and the feel of this heel, and it makes me happy because I was just trying something out when I did it this way. The socks are now available to download on Ravelry. Enjoy! I've gotten into a bit of a rut in my knitting since finishing my Effortless Cardigan. I've been working on a project that I can't show you, working on spinning the never-ending second bobbin of polwarth/silk laceweight, and slowly making progress on my Cranford shawl. That is the next project that's going to get my serious attention. In this incredibly horrible picture (this time of year really bums me out with the lack of light! ), you can see that I've finally gotten to the midpoint and beyond. I've finally reached the part where I decrease on every row, meaning the rows are getting shorter and therefore faster. The rows are still pretty long (I still have 100+ stitches in each row), and it's getting to the point where the shawl is a bit unwieldy to turn back and forth, but I know that if I can sustain some attention on this project -- which I intend to do -- it won't take me too long to finish up. Good thing, too, because it's been getting cold and I'd love to have this finished to wrap up in! I've been waiting impatiently to show you my most recently completed project -- this time of year just does not work for blogging knit objects when you work full time! 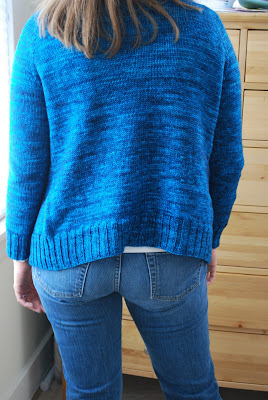 I had to wait a couple of days for the sweater to dry post-blocking, and then I had to wait until this weekend, when there was enough good natural light for the Mister to snap some decent shots of me in it. I think it was worth the wait, frankly, because this is my new favorite sweater. I love, love, love this sweater. It was an easy knit (though I still managed to mess up somehow -- I missed a couple of raglan increases and had to sneak them in afterward because I didn't want to rip back, but I don't think you can see the error) and it went really quickly. Of course, that last assessment might have something to do with the fact that I knit most of the sweater over the course of my five-day Thanksgiving weekend. For the record, I don't recommend flinging yourself down a flight of stairs in order to wind up off your feet for several days just so you can knit a sweater, but it was certainly one positive in the whole mess that was the fall and the resulting sprain. I had knit with a Madelinetosh yarn once before (with tosh sock for this shawl), but this is the first time I'd used enough for a large garment, and I must say that I am in love. The colors of this yarn just enchanted me the whole time I was knitting, and I'm really happy with the finished look of the sweater. 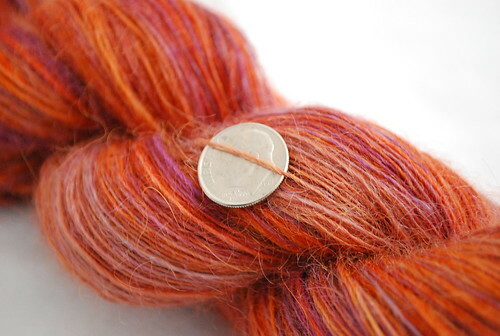 You know how you're "supposed to" alternate skeins when you're using a hand-dyed yarn? I didn't, I'll admit it. And you'd can't tell that I didn't. This yarn is amazing. I think I am officially addicted. Now let's talk about the sweater itself. It's a top-down raglan, knit entirely seamlessly. While I like the structure of a seamed sweater, there is a lot of appeal in a sweater that's done when you bind off the last stitch. I used the same size needle for all of the sweater, including the ribbing, which makes said ribbing nice and flow-y. I was a bit puzzled by the needle size specified in the pattern (US 9) because I'm usually a pretty on-gauge knitter and usually don't have to go up or down more than one needle size. The only explanation I have is that Hannah Fettig must be a tight knitter! I got perfect stitch gauge (and I was only one row off over four inches for row gauge) with 6's, which is what I often use for a worsted, so that was fine with me. The sweater turned out the right size, got nice and drapey after blocking, and is incredibly comfortable. What's not to love? My spinning has been pretty monogamous (or should that be monotonous?) lately, as I'm still working my way through the second four ounces of All Spun Up Polwarth/silk. I'm making good progress and am going to be devoting a good portion of my crafting time this week to finishing it up, but I won't bore you with another on-the-bobbin progress shot. Instead, I have a little spinning treat to share with you. Before my friend Steven left the state, he generously bestowed upon me a bag filled with small samples of some super luxurious spinning fibers, among them a two ounce bundle of Blue Moon-dyed 50% cashmere/50% tussah silk. Now, I've spun silk before (in blends) but never cashmere, so I'll admit that I was a little intimidated by this gorgeous fiber and left it to marinate in the stash for a while because I didn't want to risk ruining (or, at the very least, wasting) it. Yesterday, though, I decided to take the bull by the horns and give it a try. Now I'm wondering why I waited so long. It's definitely a little trickier to spin than the fiber I'm used to, but not as bad as I thought it would be. The biggest challenge, I think, has been the fact that my fiber hand is getting very warm from holding the cashmere, so I keep having to stop and let it cool off so that I don't wind up with a felted handful of fiber. I'm using my favorite Bosworth midi and doing a two ply of what I expect will be laceweight. I'm imaging that the resulting yarn will make a lovely (and very warm) lacy cowl or smoke ring when it's done, which I hope will be soon. I've decided to join the monthly spinalong in the Ravelry spindlers group, so that should be good motivation to get it done by the end of the month! Do Some Good, Win Prizes! This is Wensleydale that came from last year's Crown Mountain Farms fiber club. There are approximately 770 yards of laceweight singles in the this skein, so plenty to do a good-sized shawl. It's one of at least three skeins of handspun available as a prize, in addition to some gorgeous yarns and patterns. I encourage you to click over to see a slide show of all the prizes and get the details on how to win.